Since 1988, Rowdy McBride Guide Services is well established as one of the world’s premier international professional guiding and outfitting services for free-range sheep, with an established global clientele whose success rate is in the 99% plus range for completed hunts and record-setting trophy animals in North America and Asia. This professional outfitting and guide service enjoys significant repeat business and offers unsurpassed resources including West Texas’s most sought after trophy-productive ranches. These include family-owned and highly exclusive properties under active lease, encompassing hundreds of thousands of acres. 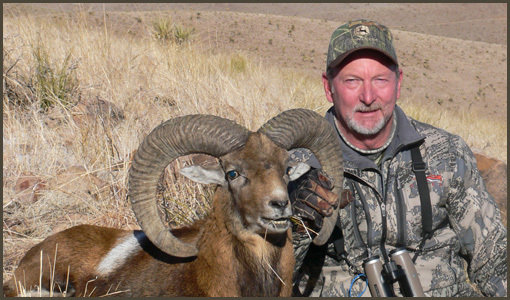 Along with free range Auodad and Desert Bighorn species, no other professional guiding service provides access to the incredibly rare, free-range Armenian and Red Sheep which are an international attraction to the world’s foremost sports hunters. Game species offered to our hunters include: Auodad (Barbary) Sheep, Armenian Sheep, Red Sheep, Desert Bighorn, Mountain Lion, Antelope, Mule Deer, and Javelinas. Every hunter’s goals are discussed in-depth to create a personalized experience with a maximum opportunity for success.